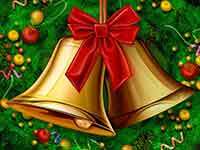 Английские упражнения по теме Рождество – Christmas exercises – помогут вам узнать о том, как празднуется Рождество в Британии. Выполнив предложенные Christmas exercises, вы закрепите лексику по теме РОЖДЕСТВО. На сайте также есть упражнения про другие праздники. Exercise 1. Find the right answer. 1 What are the most popular Christmas colors after green and red? 2. What food is often left out for Santa? 3. What is the most popular treetop ornament? 4. How many pipers piping did my true love give me? 5. Which country (on territory of which country) started the tradition of exchanging gifts? 6. Which state of the USA has a city named Santa Claus? 7. What colour is Santa’s belt? 8. Who are Santa’s little helpers and toy builders? 9. What is the name of the red-nosed reindeer? 10 When is Boxing Day? Exercise 2. Give short answers. Did you decorate a Christmas tree last year? Is there a fireplace in your house? Are you going to send Christmas cards this year? Does your mum cook roast turkey for Christmas dinner? Are there any Christmas stockings in your house? Exercise 3. Find the odd one out. Try to explain your view. Wreath, candy canes, bells, lily of the valley, fir tree. Exercise 4. Insert the verbs in the past form. Yesterday was Christmas Eve, the 24th of December. It (1) __________ a nice day. At first my friends and I (2) _________carols in the streets. Then in the evening I (3) _________a Christmas stocking by the fireplace and (4) _________ to bed. At night Santa Claus (5) ____________. He (6) ___________ presents into the stocking. In the morning I (7) ___________ cool roller skates in the stocking. Exercise 5. Write in the prepositions in, on, at. British people celebrate Christmas ___ the 25th of December. Yesterday Sally got up ___ 6 o'clock. We decorated the Christmas tree ___ the evening. I got a Christmas card ___ Monday. The children found a lot of presents ___ the morning. We are going to the museum ___ January. Exercise 6. Write the sentences. you / Did / a cake / at Christmas / make / ? sister / magazines / every / My / day / reads / Christmas. on / to the Christmas party / The children / Saturday / went /. the 25th of December / you / on / Christmas /celebrate / Do / ? Molly / are / and / crackers / now / pulling / Rick. Ответы к упражнениям на тему Рождество. 1 – b, 2 – d, 3 –b, 4 – a, 5 – d, 6 – a, 7 – c, 8 – a, 9 – b, 10 — c.
Dunkan – is not one of the Santa’s reindeer. Mashed potatoes – is not a traditional Christmas food in the UK. Paper kittens are not traditional Christmas decoration. Did you make a cake at Christmas? My sister reads Christmas magazines every day. The children went to the Christmas party on Saturday. Do you celebrate Christmas on the 25th of December? Molly and Rick are pulling crackers now. 2 Комментариев для "Лексические упражнения по теме Сhristmas"
Здравствуйте, очень нравится ваш сайт. Лексические упражнения просто чудо. Очень заинтересовал вопрос How many pipers piping... Ответ нашла в Рождественской песне.Только там ответ 11.